In this review we show that “Fintech Limited” is a binary options scam. It is presented by Daniel Roberts. 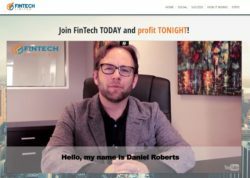 Roberts says that his company Fintech Limited created a binary options trading app that works on autopilot and can make you hundreds of dollars per hour. In other words Fintech Limited can allegedly make you a millionaire. And don’t expect to pay anything for it, becoming millionaire is free, as always. 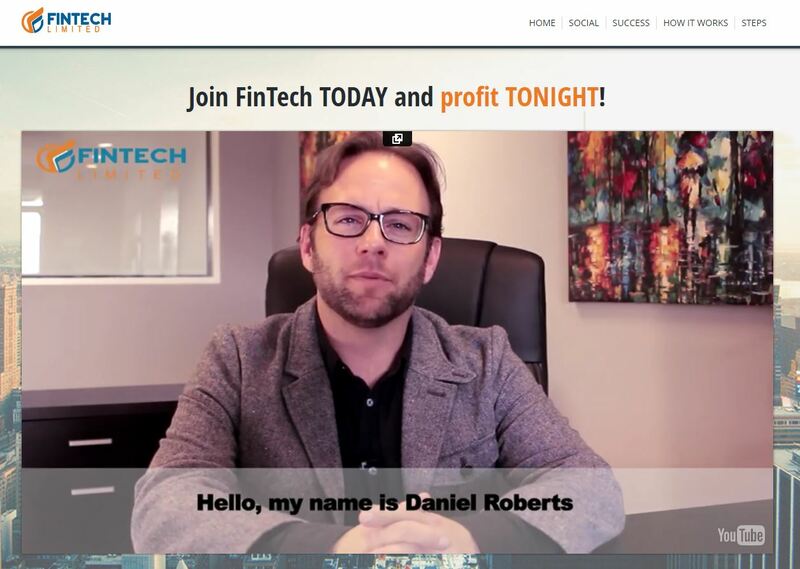 Daniel Roberts does not exist, Fintech Limited does not exist. This is the truth. The video is completely fictional and the story is just a fairy tale designed to make you join a certain binary options broker and deposit money. If you then trade your account with Fintech Limited, you will lose your money and you will never be able to join Roberts again. 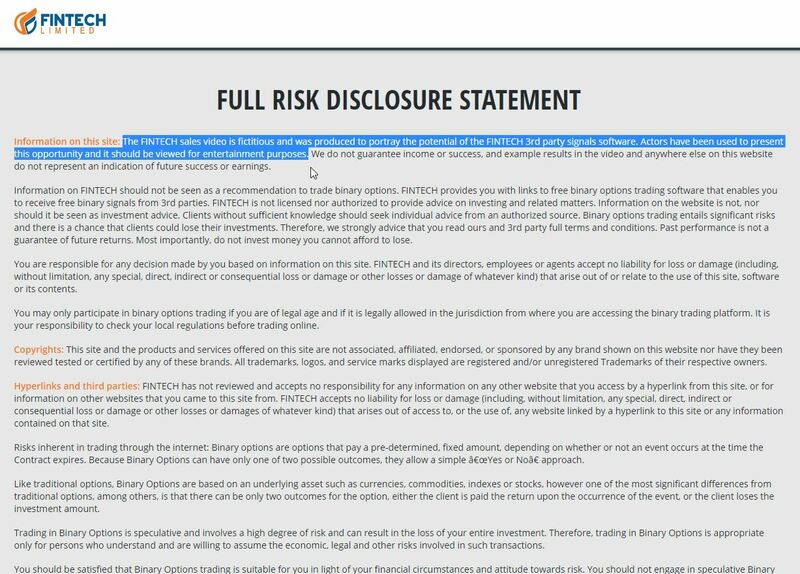 What we have just said about Fintech Limited does not need any real proofs, because people who created this scam admit these facts in their Disclaimer. Look at the picture, it is written. 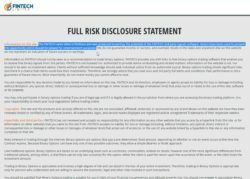 It is sad how scammers think that everything is all right when they make a presentation full of lies and admit in a disclaimer linked at the bottom of the page that it is just a huge fake. So not only the story is fake, but also the testimonials are not real. So the Fintech software is in reality worthless, trading signals are more or less random. This gives you a win ratio about 50 %, so it is as good as tossing a coin. In any case it is not good enough for trading binary options. Fintech Limited is just another scam based on a well-known principle. If you trade your money with it, you will lose it. Real binary options trading and money making happens with regulated brokers. If you want to see how it works, try a free demo account to see if you are able to trade profitably and achieve real profits. 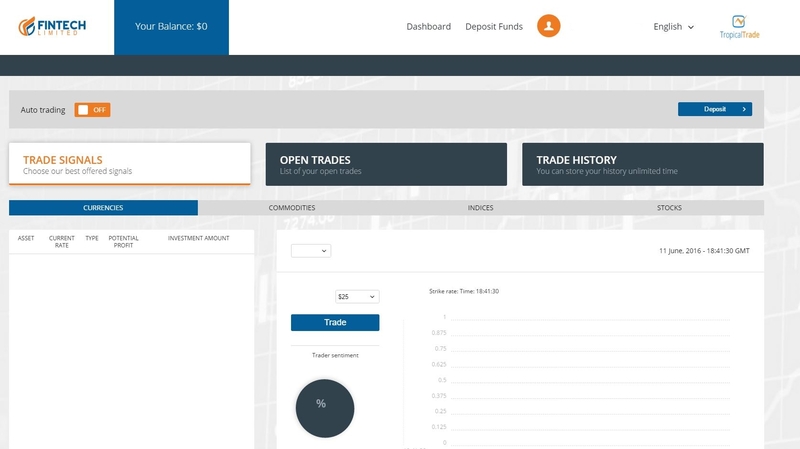 Trade with real money only if you are able to make profits on a demo first. That happened to me when i joined fintech ltd.I lost my whole $250.Their so-called ‘software’ is crap!!! People please stay away from this creation of Daniel Roberts (if it is his real name)After loosing all my cash he send me emails to join Millionaire Blueprint,the cheek of this guy!!! I was so confused because that is the so-called ‘software’ of Walter Green. There is just no end to this people’s heartlessness. Please stay away from these criminals. The are very convincing and get to know you. At first you make a ‘profit’ and when it starts to turn to a loss they convince you to put more money in to salvage your losses. When in fact you are not even trading, you are on a simulated trading account, effectively a video game. You will lose all your money like I did. When you try to get it back they harass and threaten you. They all use false names. This has happened to me too. I have lost all my savings. Practically over night. When you try to contact them for help, in a state they are not available and your account is wiped out and closed down. Likewise through working with various agencies I have discovered I was never actually trading my money went to these people who have no morals and will stop at nothing to steal your money. I know. They are scum. I have cancer, I lost all my money. I asked for my money back to pay for my treatment. They sending spy ware and viruses to my e mail now, stay away from them.